For information click on PHOTOGRAPHY header above. Order code, is in bold lettering, on title of each photograph. and a great mimic, copying the sounds of many other species. 'quardle oodle ardle wardle doodle'. See sample of close up below. when the male 'Cob' and female 'Pen' swans changed shifts on their nest and exposed their massive eggs. 'Pen's treasures' is my personal favourite. 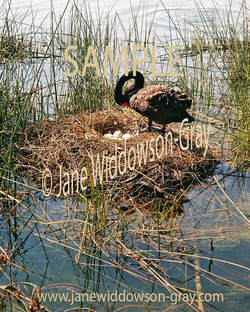 The photos of these swans nesting are taken in their natural environment at Lake Monger, Western Australia. as without him I would not have these pictures. BS (III) Changing Shifts, female 'Pen' returns to nest. Black swan (IX) Meander river, Deloraine, Tasmania. Right place, right time to get this shot of a black swan, with reflections of dark clouds and the movement of water making interesting patterns. This is also listed under Photography/Tasmania/Deloraine. White duck in Tench Pond, Deloraine, Tasmania. curling up and going to sleep. Rescued, after Mum was the sad victim of a road kill. When this Joey was found in Mums pouch, she didn't have any fur and was stone cold. She was very strong and resilient and with lots of TLC she survived, but sadly passed away when she was a little older...as she ate something in the garden that she shouldn't have. for medicine, wrapping food, making cradles and humpies. to appreciate the colours and texture in the tree. I discovered its beauty while walking through a graveyard in WA. this is another one of my more unusual creations. My horrible cat, at the time, had killed this beautiful bird. and other materials around it to give a crumpled shadow effect...covered it to block out the light and photocopied it. It was strange handling it (to say the least) but I did it in the name of art! in my Draughtsman's drawers...along with hundreds of other pictures from my Art College days. This is only part of the picture, as I had to crop it to an 8x12 (A4) size, originally it was twice the size, an A3.